I use the term "Skinny" very loosely for this milkshake. The milkshake part IS skinny since it is made with frozen bananas rather than ice cream. I added some instant banana pudding mix to give it that yummy pudding flavor. You could easily use sugar free pudding mix here. Now . . . the Chocolate Malt Whipped Cream is TO DIE FOR!!! Can you just taste it now? Fresh whipped cream mixed with Chocolate Malt Powder and a little vanilla. The flavor is just like a chocolate malt. You are guaranteed to sneak many spoonfuls of this whipped cream before it makes it to the milkshake. BUT . . . The whipped cream obviously is NOT skinny. 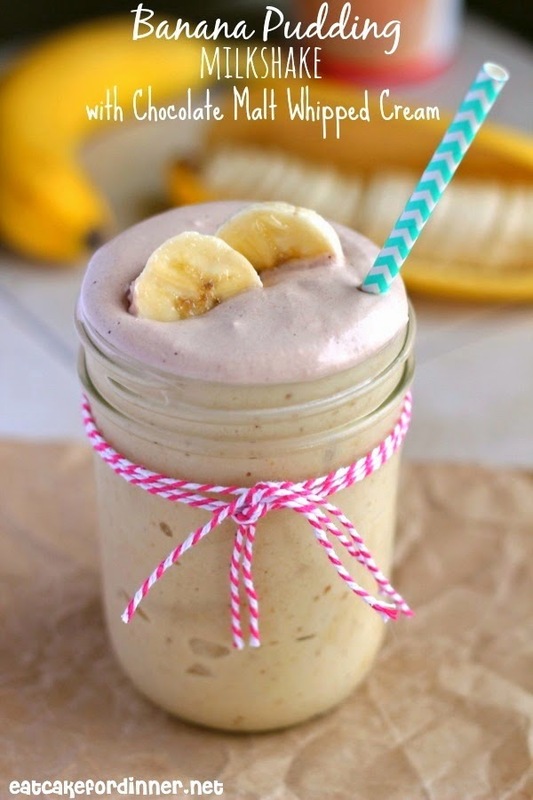 If you want to skip the whipped cream, you can mix the Chocolate Malt Powder directly in with the bananas and save a the calories. 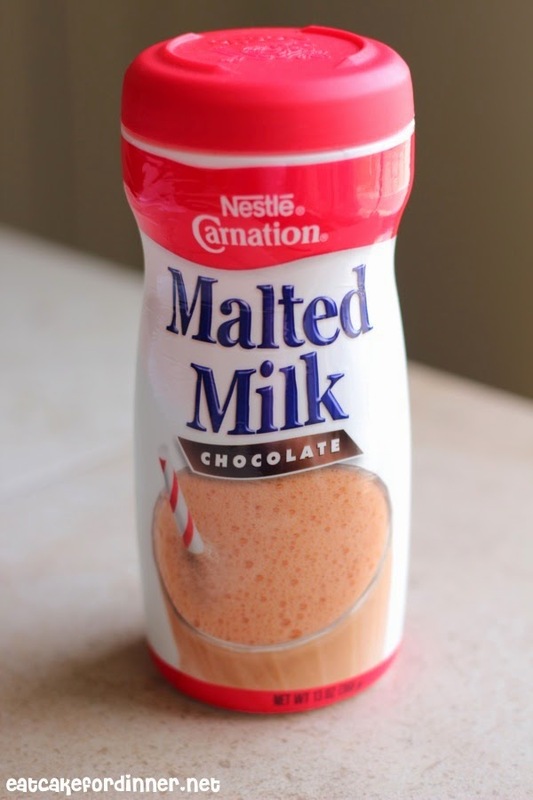 When I was younger one of my favorite breakfasts was blending a package of chocolate malt Carnation breakfast mix, milk, a banana and some ice cubes into a smoothie. This was long before I knew that frozen bananas created a thick and creamy ice cream consistency when blended. 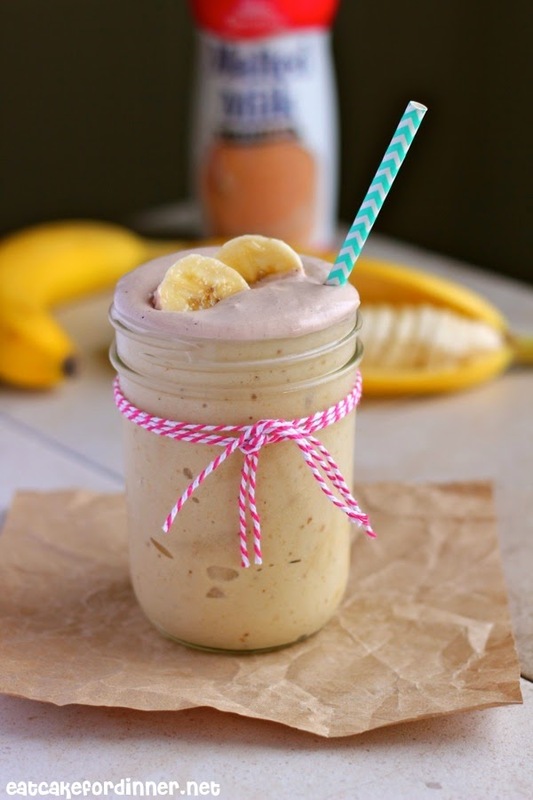 Chocolate Malt and Banana really is a DIVINE combo. You will LOVE this milkshake. Your kids will love it too and they won't even know there isn't ice cream in it. At my local grocery store, the Chocolate Malt Powder is down the aisle with the Peanut Butter, Jam and Coffee. 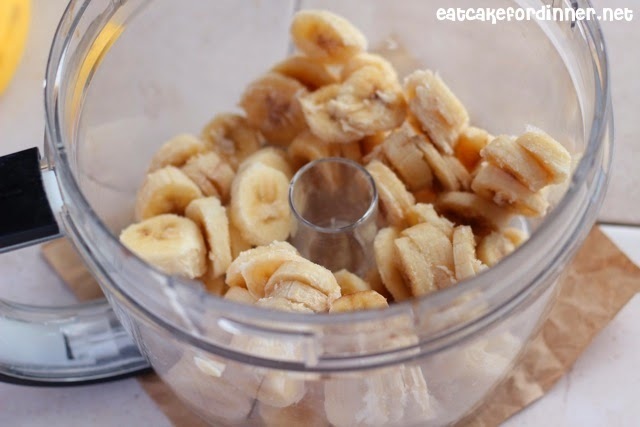 Peel ripe bananas, slice and place in an air-tight container; freeze until completely frozen. I usually let mine freeze overnight. 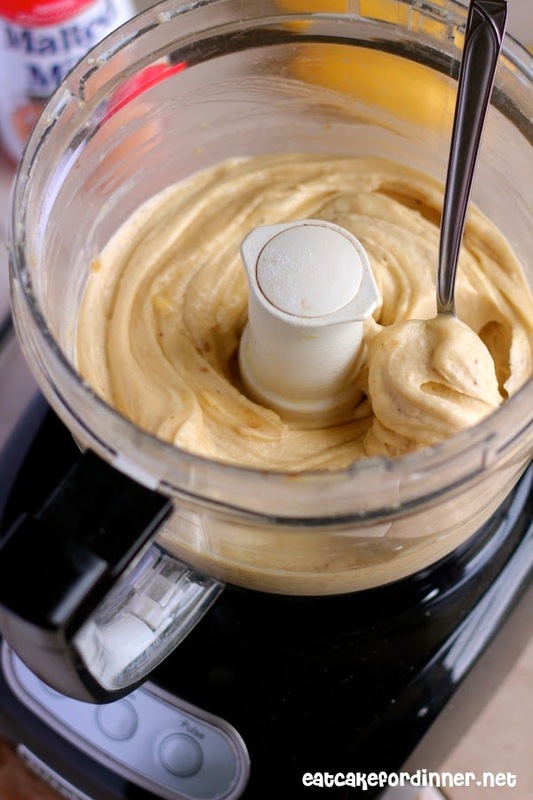 Add frozen bananas to a food processor and blend until chunky. Add the pudding mix and vanilla extract and blend until completely smooth and creamy and the consistency of soft serve ice cream. Blend in a little milk at a time, until it reaches milkshake consistency. Divide between two small cups and top with chocolate malt whipped cream. Or blend chocolate malt powder directly into the bananas and skip the whipped cream. Makes 2 small milkshakes. For the Chocolate Malt Whipped Cream: Pour whipping cream into a chilled bowl. Beat with a hand mixer until frothy. Add the chocolate malt powder and vanilla and continue beating until it reaches desired consistency. Jenn's Notes: Make sure to use ripe bananas, or the "green" banana flavor will overpower everything. Oh my goodness! I have forgotten about Carnation Chocolate Malt mix! My childhood dreams are flooding back to me! Thanks for the recipe! Ha ha . . . I love that malt powder. Thanks! I love malt mix! This milkshake looks so thick, definitely need to try this soon! And love how cute you made the glass!